(February 27, 2009) – One way to save money is to make your food at home. If nothing else, you save money by not driving to a restaurant. You can make food that’s better for you, and if you have food allergies or need to watch your diet, you can carefully choose the ingredients in the food you make. Let’s start with bread. Commercial bread is made to maximize profits for the shareholders of the companies that make it. Nothing wrong we that – we like profits. We just don’t like to needlessly pay for them. You can find simple ingredients for bread at the grocery store, and bread easy to make. I’ve made many loaves by hand mixing the dough in a bowl, letting it rise, then cooking it in the oven. I’m now convinced that a bread maker is easier. Find a thrift store in an upper middle class area. A lot of churches have them. I see cast aside bread makers at these places on almost every visit. They usually sell for five bucks, tops, much cheaper than new. And if you shop carefully, you may find one that’s never been used. With a bread maker, you toss everything in and walk away. It mixes, kneads, and bakes the bread over the course of several hours. Many have timers to let you enjoy just-baked bread when you wake up in the morning, or when you come home at night. By baking overnight, you use electricity generated in the non-peak hours, which may also save you a few cents. I don’t have a way to test, but it seems logical that since the bread machine heats a smaller area when baking, it uses less electricity than your oven. Recipes for machine baked bread are all over the Internet, and there are a number of books published containing only bread machine recipes. vegetable oil (I use olive oil) – 2Tbs. salt – 2/3 tsp. Be sure to include the salt – it’s necessary for baking. Throw the ingredients in the bread machine in the order given. Set the machine to large loaf, regular or whole wheat cycle, depending on the flour you used, with a medium crust. Your machine may or may not have all of these settings. The olive oil is supposed to be good for you, and the heart association says oats help reduce cholesterol. 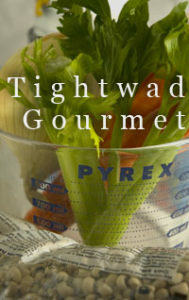 We’ll be publishing more tightwad fine dining ideas.